Never heard of California Barbecue Chicken before? That's ok, most people haven't. That's because this very unique recipe has absolutely nothing to do with California! 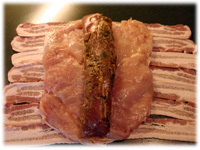 What it does have going for it is tender pork tenderloin seasoned with chimichurri sauce and then enclosed in tender chicken breast. 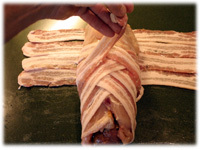 To top it off we wrap it all in bacon before it hits the barbecue. 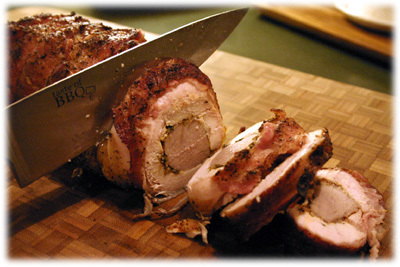 Kidding aside, this is actually one of the most delicious barbecue chicken recipes you'll find, with the pork tenderloin in the center and the bacon on the outside the chicken stays very moist and juicy. When it comes off the barbecue - snip off the strings and cut the meat into 1" slices. 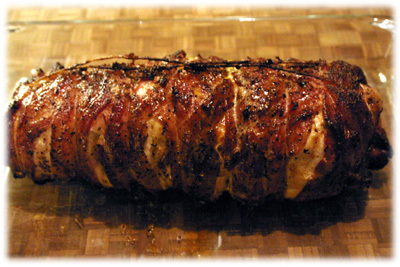 This is great served with a creamy garlic sauce and is a perfect recipe for gourmet dinners. 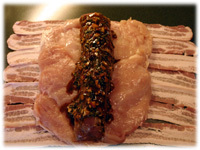 Pierce the pork tenderloin all over with a fork to allow the chimichurri sauce to penetrate while marinating. Place the tenderloin in a resealable plastic freezer bag and pour in 1/2 cup of the chimichurri sauce. 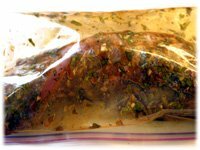 Seal the bag and place on a plate in the refrigerator. 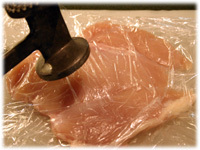 Place a boneless, skinless chicken breast between two sheets of plastic wrap and gently begin pounding with a meat hammer (or rolling pin, or other blunt instrument) to flatten evenly to about 1/2". Don't pound too hard or the meat will begin to break apart. You want to pound over the entire surface to flatten it into a uniform shape. Repeat with the remaining 3 chicken breast pieces. 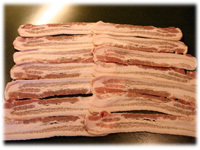 Lay out 6 to 8 rows of bacon strips (2 strips in each row) on your work surface. In each row one strip will partially overlap the other one. Center the 4 flattened chicken breasts on the bacon strips. Slightly overlap the chicken to prevent any gaps through to the bacon. 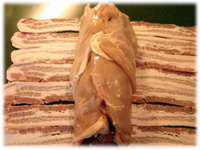 The bacon should still be showing out each side of the chicken. 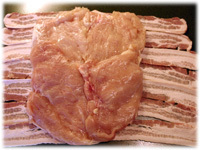 Remove the pork from the marinade and lay it in the center of the chicken. Pour the remaining 1/4 cup of chimichurri recipe over the pork tenderloin. 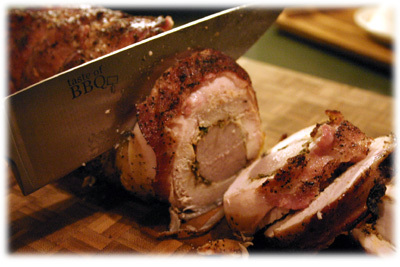 Pull up the sides of the chicken breasts to enclose the pork. Try to get this as tight as possible and slightly overlap the chicken to completely seal it in. 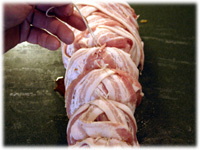 Begin wrapping the bacon diagonally up and over the chicken - first one side then the other side so each end gets tucked in. Slide short pieces of string under the roast and pull them up and tie them off. Do this every 1 1/2" along the length of it to ensure it stays together and the bacon doesn't fall off. Once you've tied all the shorter pieces take another longer piece of string (about 2 1/2' or 3' long) and weave it length-wise over and under each short piece of string. When you reach the other end, roll the roast over on your work surface and repeat back up the length of the roast to the other end. The california chicken requires Indirect cooking. Place a drip pan under the cooking grate to catch the dripping grease. Place the roast on the grates and close the lid. Every 15 minutes or so roll it over so the bacon gets cooked on all sides. 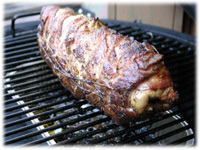 Remove the roast from the grill when it reaches an internal temperature of 160F. Cover the california chicken with foil for about 10 minutes to rest. Remove all the string and carve in 1" slices and serve.